The parish church of St John the Baptist has long been known as "the Lantern of the West" because of the superb windows which admit such a flood of light. The windows are an early example of fully developed Perpendicular with the tracery of the Reticulated Transitional Perpendicular style, dating to between 1380 and about 1400. In earlier times the Churchwardens' accounts frequently refer to payments to plumbers (the early name for glaziers because the glass in windows was mounted in lead; Latin plumbum) because schoolboys had broken a church window or two. But in 1734 the sum of £2 2s was paid "for Glazing ye windows broke by ye Hurricane" (about £3,800 at today's value). 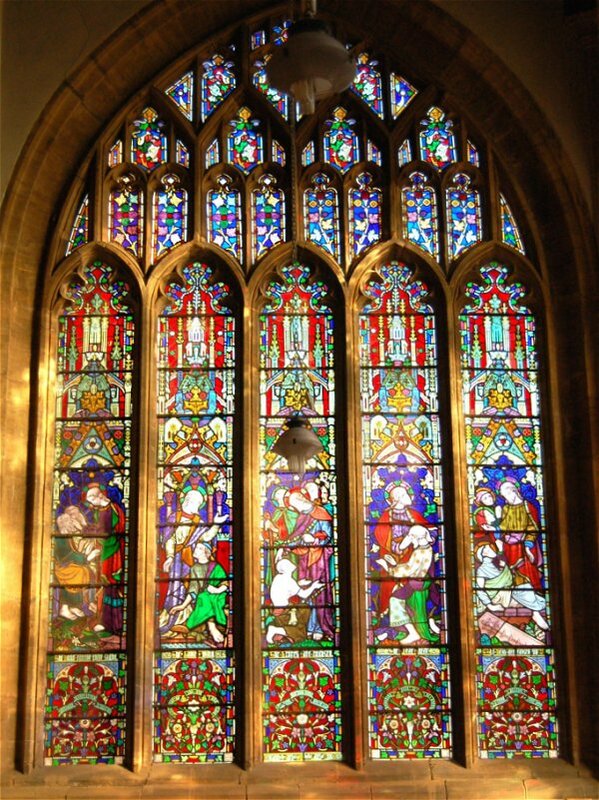 The beautiful stained glass in the windows of St John's church that we see today are all Victorian, with the exception of the Prowse memorial window in the north aisle. 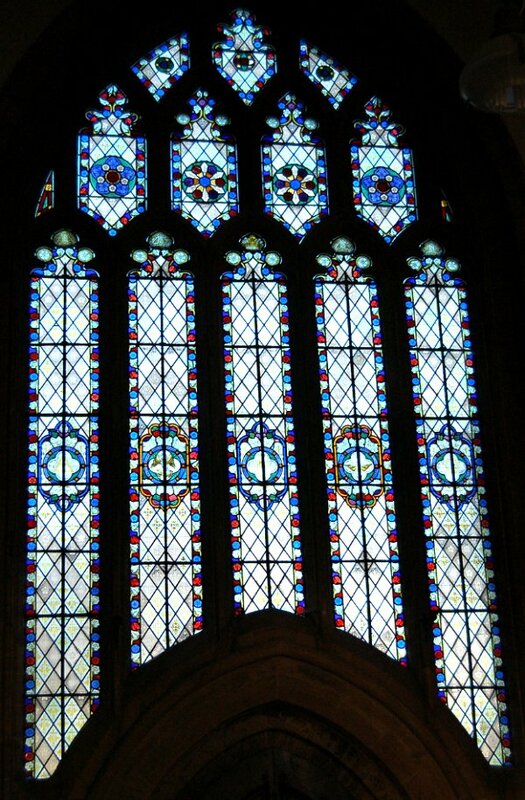 The 'patterned' diamond-shaped glass in both north and south aisles were by Nathaniel Wood Lavers (1828-1911) and Francis Philip Barraud (1824-1900) who were part of the Gothic Revival movement that affected English church architecture in the nineteenth century. At 8:15pm on Saturday 12 October 1940 a Second World War bombing raid destroyed a wing of Church House abutting Church Street, opposite St John's, and the blast also did damage to some of the church windows. Not all windows are shown below, some of the plainer, repetitive examples have been omitted. The north aisle, bay 1, by Lavers & Barraud. The north aisle, bay 2, over the north door, by Lavers & Barraud. 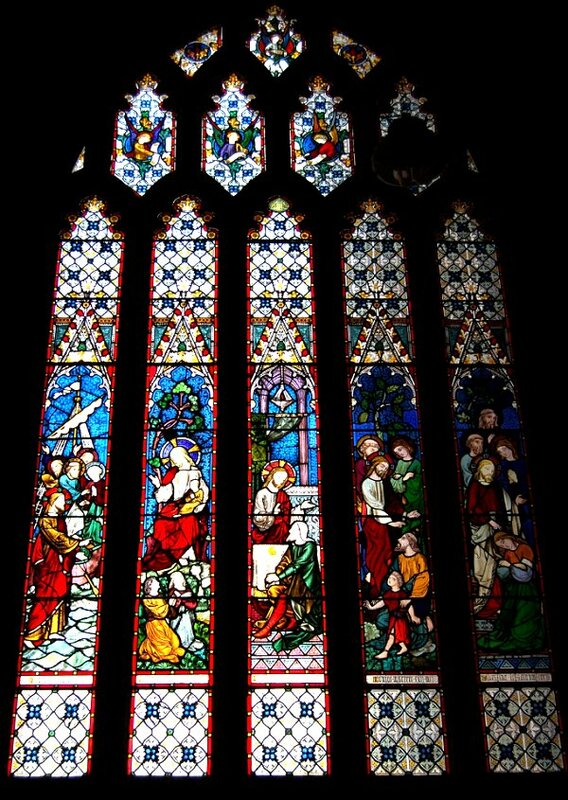 The Prowse memorial window in the north aisle by Henry Holiday. This was installed in 1917 in memory of brothers Brigadier-General Charles Bertie Prowse and Captain Cecil Irby Prowse RN who were both killed on active service, a month apart, in 1916. 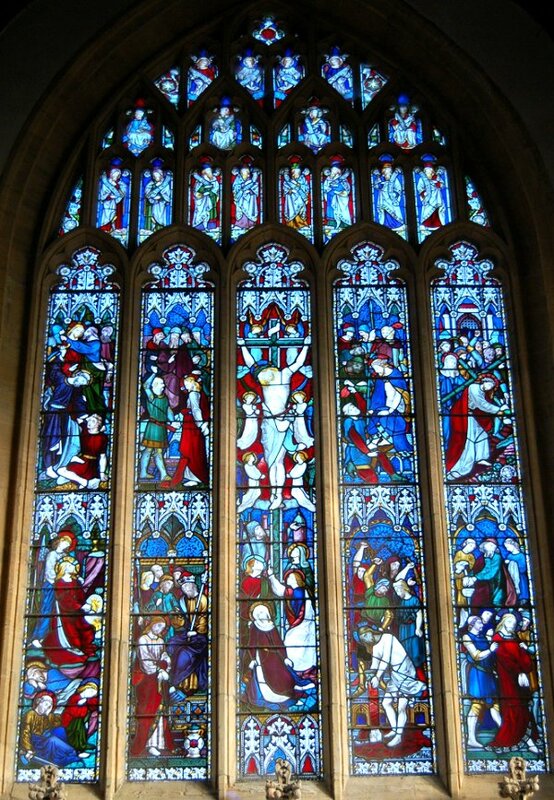 The next window to the east of the Prowse window (not shown here) was provided in 1861 by Yeovil draper James Curtis Jnr as a memorial to his family, although there is nothing to show the gift. It too is by Lavars & Barraud. The Chantry of the Holy Cross was founded in 1432 in the north transept of St John's church. The north transept became the family pew of the Harbin family of Newton Surmaville. The Harbin family vault lies below the floor of the transept and family memorials adorn the walls. 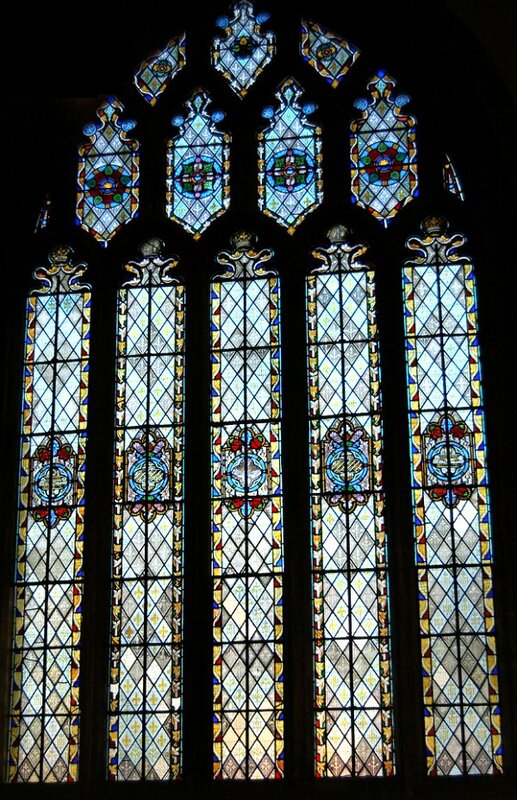 The north window of the North Transept. 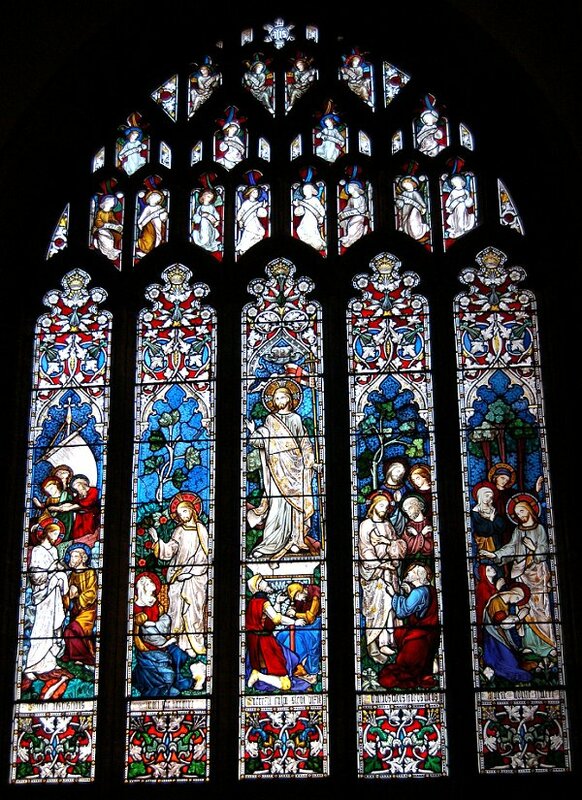 Dating to 1879, this was the last of the Victorian windows to be inserted and depicts the Ascension with disciples, and above is the angelic host with figures of the Patriarchs below. 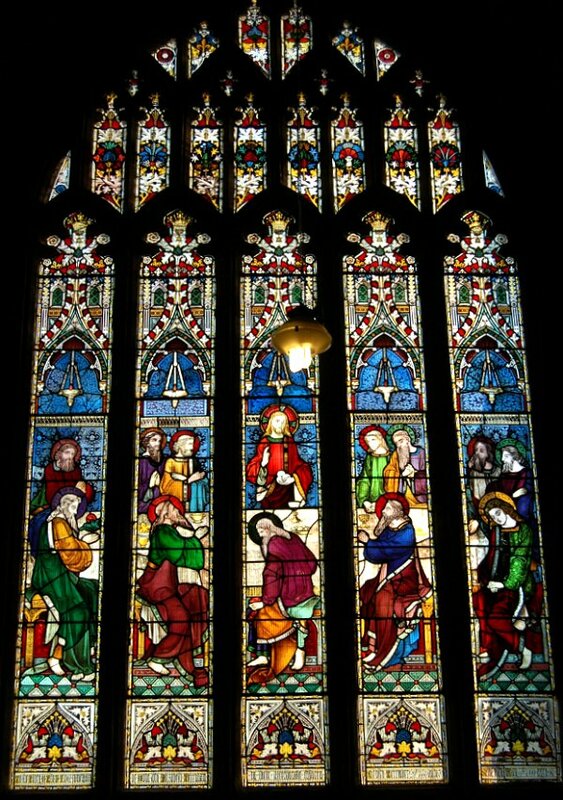 The window is by Hardman of Birmingham and its cost of £250 (about £105,000 at today's value) was borne by the Feoffees of the Church Lands. The Chantry of the Name of Jesus, also known as the Chantry of Jesu, with the altar of St Thomas the Martyr, was located at the eastern end of the northern aisle of the chancel of St John's church. This was the last chantry to be founded in St John's and came into being in 1480 as the result of a guild being formed for its maintenance in association with the establishment nearby of Woborn's almshouse four years earlier. 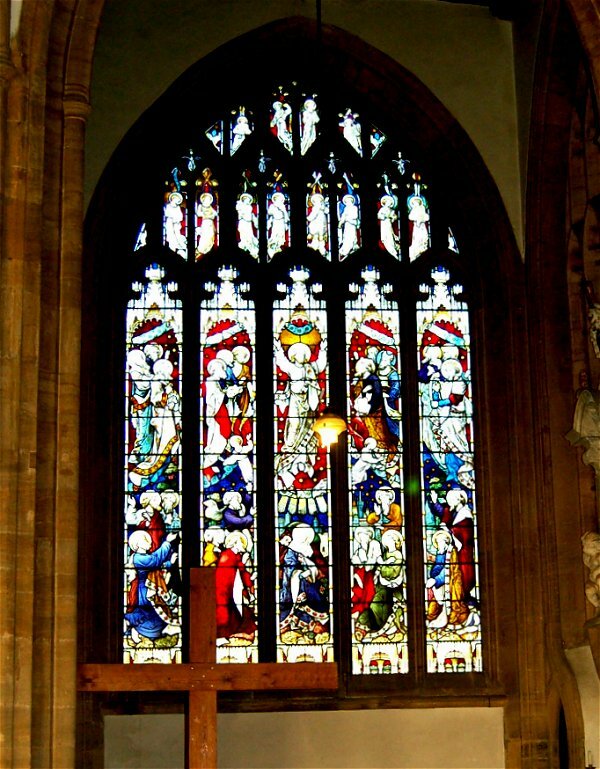 The north window (not shown here), adjacent to the organ, is a memorial to William Neal, who died in 1834, and was given by his nephews and nieces in 1874. The east window of the North Choir Aisle. This was inserted during the 1859-68 restoration of the church and depicts the five resurrection appearances of Jesus, the five lights showing - 1. Jesus standing on the shore inviting the disciples to breakfast. 2. Jesus speaking to Mary Magdalene, who has mistaken him for the gardener. 3. The scene at the tomb. 4. Jesus showing his wounds to Thomas. 5. The two Marys and the disciples being met by Jesus. 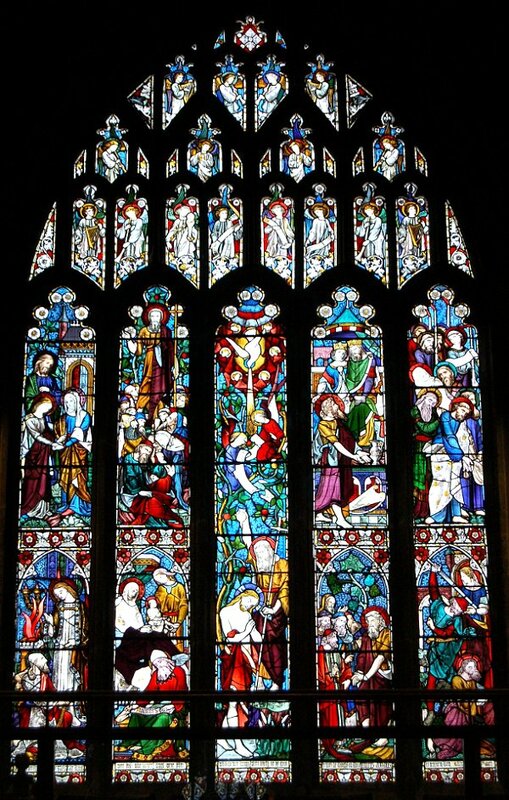 The east window was inserted in 1863 and depicts scenes from the Passion. The Chantry of the Holy Trinity, also sometimes known as the Chantry of the Holy Ghost, was founded in 1342 in the parish church that preceded the present St John's church. When the latter was built, the chantry transferred to this south choir aisle of today's church. The chapel was re-established as a chapel dedicated to the Holy Trinity in 1962. The three windows of this chapel date to the 1859 restoration and are by Lavars & Barraud. The South Choir Aisle east window depicting Matthew 11.5 - the five lights are inscribed 1.The blind receive their sight. 2. The lame walk. 3. The lepers are cleansed. 4. The deaf hear. 5. The dead are raised up. At the bottom of the central light is inscribed "Dedicated to the Glory of God by the ladies of Yeovil, AD 1859". The South Choir Aisle, south wall, east window which includes the presumed unique black halo of Judas in the second light. The scenes depict - 1. Jesus admonishing those who had brought him the woman taken in adultery "Let him who is without sin among you be the first to throw a stone". 2. Jesus answering the sons of Zebedee. 3. Jesus feeding the five thousand. 4. Jesus with the woman of Samaria at the well. 5. Jesus calming the waters. The South Choir Aisle, south wall, west window depicts - 1. Peter walking on the water. 2. Children being brought by Jesus to bless. 3. Jesus speaking to Zaccharius, who had given away half his goods. 4. Jesus healing the epileptic boy. 5. Jesus speaking to the woman with an alabaster flask of ointment. The chantry of the Virgin Mary 'within' was a chapel in the south transept of St John's church. It was transferred here from the earlier church where it had been in existence certainly from 1302. 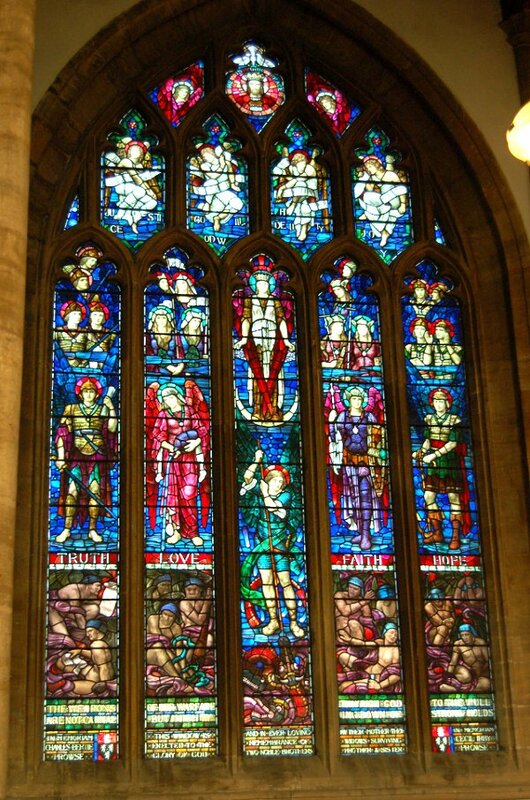 The south window of the south transept was inserted in 1862 as a memorial to John Greenham and his wife Elizabeth from their children. It cost £210 (around £130,000 at today's value) and depicts the Last Supper. 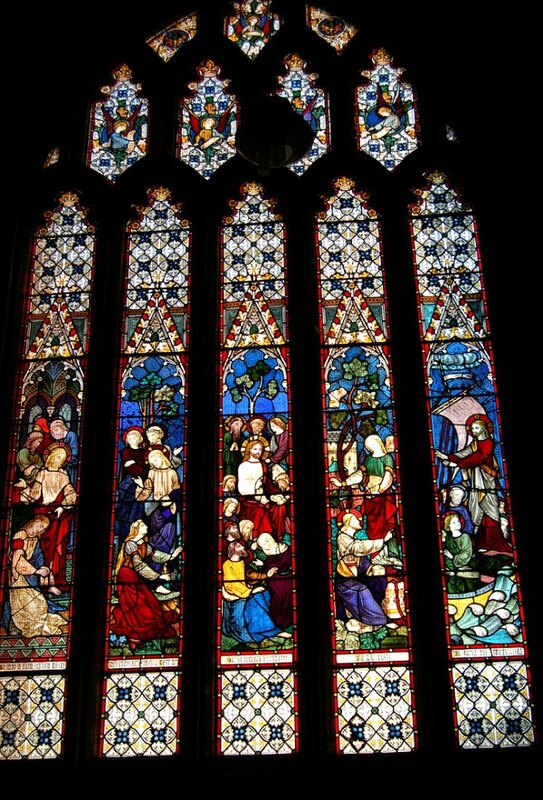 This is another window, like the east window, where Judas Iscariot is shown, at centre foreground, with a black halo. The west window of the south aisle. 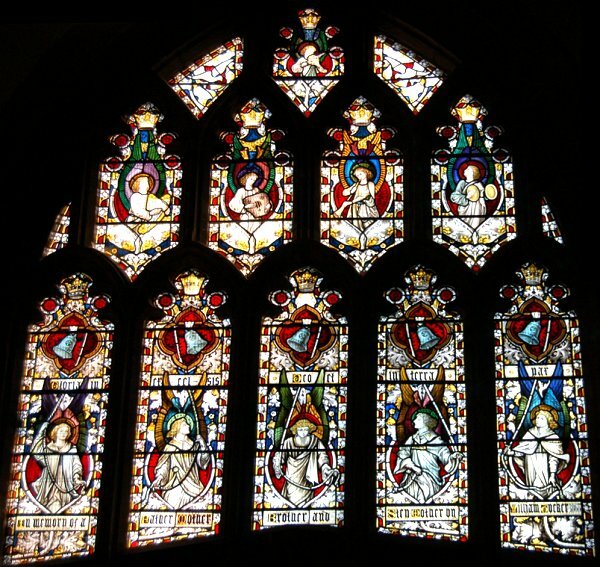 The window above the south doorway, installed in 1863 by innkeeper of the Glovers Arms, glove manufacturer and town developer William Tucker in memory of his parents, stepmother and brother.